Mini-me! You know you want one...wanna win it? | Primary Planet! Mini-me! You know you want one...wanna win it? Ahhhhhhhhhhhhh! Isn't it cute? I am sooooo thrilled my with mini-me! It was made by the fabulously talented Crystal Fox: The Library Fox! She was extremely fun to work with and took all of my crazy silly requests and turned it into a perfect mini-me! Can you just sense the geekiness? The book that I am holding is the book that my youngest son is named after "A Prayer for Owen Meany" by John Irving. My all time favorite book! Anyway, let's get to the fun stuff! 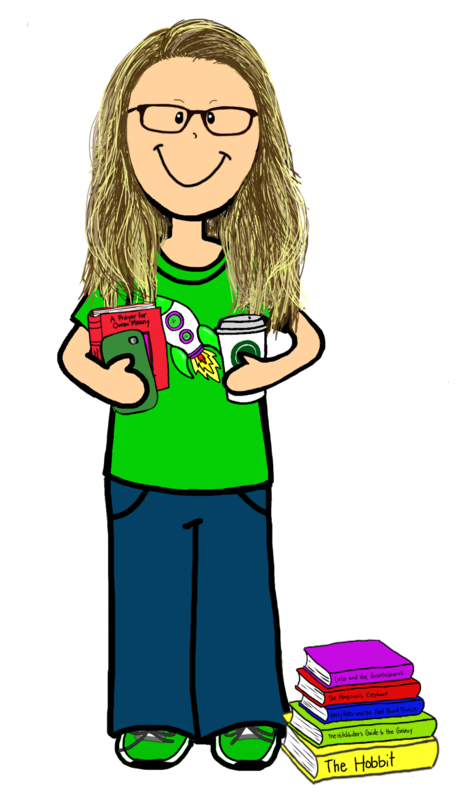 Crystal has generously agreed to do a mini-me for one of my readers! Woo-hoo! You can enter my little giveaway using the rafflecoptor below! This giveaway will only run until Sunday, so do it now! Good luck! Thanks for the giveaway! I love the little blue bird! Thanks so much for stopping by Cindy! He is cute isn't he? He is the twitter bird! Thanks Mrs. Goodwin! I love it too! Love these! So very cute. Thank you! Thanks so much for stopping by Stacy! Good luck! A Prayer for Owen Meany is simply fantastic! You have very good taste in literature!! Well thank you! I am a bibliophile! I love mine! Good luck!